It’s that day again. That day you wait a whole 364 other days for. The day you make little calendars for and tick off each day as it goes by, inching you s-l-o-w-l-y closer to the goal. The day that people write songs about, make films about, make novelty drinks for, plan for, yearn for, dress for and even throw parties for. It’s my foodie gift guide! Sorry. That was an awful introduction. It’s been a few years and I’m running out of ways to start these things. As always, there’s no ulterior motive behind this. These aren’t things I’ve been paid to talk about or write about, they’re just things I love and hope you’ll love too. Yesterday, I shared my Hotel Chocolat Christmas 2016 review. A lot of the pieces I reviewed are “Selectors” – they cost £3.75 each, or £3.15 each when you buy more than three. You could make an entire hamper of them if you wanted to, or you could just buy a few as stocking fillers. If you wanted something a bit more unusual, you can get subscriptions from Cocoa Runners which will ensure high-quality chocolate is delivered to your loved one every month for 3, 6 or 12 months. If you’re lucky, they might even share it with you. 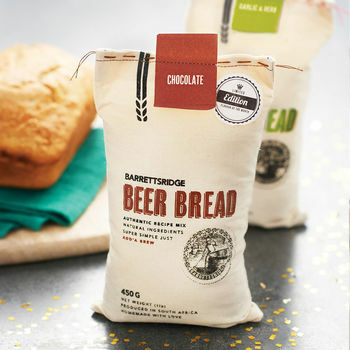 I love the idea of buying a beer bread kit for someone. You just add a beer of your choice, mix it and bake it. You can get olive and rosemary, chilli garlic and garlic and herb flavours, or buy a taster kit where you get one of each. I like this idea so much I’ve actually bought a kit for a friend and I’m very much hoping he’s not going to read this post. I’m a big fan of a Christmas hamper. We’ve given one to our parents every year for the past few, and they go down a treat. Harrods have super luxury ones for £1255 (and a range of other prices, too) whereas M&S hampers start at £30 and even include Gluten Free options. I love the beautiful Fortnum and Mason Christmas Greeting hamper for £55. And you can always buy a basket, run round the supermarket and make your own out of things you know they’ll love. What is Christmas without cheese? If you know someone who prefers savoury to sweet, why not get them a cheese basket? The Cheese Works has a fine set of gift boxes, with the £30 Christmas Cheese box serving up all the favourites. Or you can pick your own cheeses and get a custom hamper made. And of course you can always make your own edible gift – BBC Good Food have lots of ideas. Tech site Gadgette has a great list of gifts for techie foodies. I really want this mini thermometer, but to be honest they’re all great ideas. I’m also really fascinated by the idea of the five minute sandwich maker and the fact there’s a cookbook you can buy with it. How many five-minute sandwiches can there be, really? Ugghh, I love these pans more than I could possibly say. They’re aluminium, which is good for heat conduction, non-stick, durable, they stack beautifully, they have plastic lids to store leftovers, they go oven to hob and they’re just so pretty. They’re also £95, which seems quite a lot for pans, but they’re such good quality that I honestly think it’s worth it. I never thought I’d say this, but I quite want a Nespresso. I went to a Nespresso event recently (blog post coming next week) and have totally changed my mind on them. I really want to be able to make my own flat whites at home as they’re currently costing me a bomb at Pret. These can be as cheap at £50 and as expensive as £300 – shop the range here. Pretty plates, bowls and cups are always a winner. I’m a huge fan of Keith Brymer Jones’s stuff – it’s expensive but so lovely. These egg cups are adorable. I’m also a huge fan of Joseph Joseph. It’s a brand most famous for the stacking bowls, which we have, but we also bought a ridiculously expensive bin from them when we moved into the new flat and it’s changed our lives. I’d love a set of knives from them, or their pretty utensils. Also, anything from the Anthropologie kitchen range. This juicer is so cute it makes me ache. My cookbook obsession is still growing, and I fear that I would write an entire blog’s worth of stuff if I wrote a paragraph on my favourites, so here’s a quick and dirty list of cookbooks I have known and loved this year. Oh, and my recommendations from last year still stand. Go to TK Maxx and rummage their homeware section. They have some amazing stuff. Some amazing picks here, we picked up some Joseph and Joseph stuff in Home Sense recently so worth having a look if you have one near you!